When it first debuted in 1993, there were some Star Trek fans who accused Deep Space Nine—the second spin-off series in the Trek franchise—of losing sight of creator Gene Roddenberry’s optimistic vision of the future. With the show set on a space station, the Deep Space Nine crew couldn’t just zip away to the next adventure at the end of each episode. And while The Original Series and The Next Generation told episodic stories about agreeable crew members working together to solve problems, DS9 was interested in a more serialized exploration of war, religion, and a crew who didn’t always see eye to eye. But while the show may have added a few speed bumps to Roddenberry’s Wagon Train to the stars, Deep Space Nine is still recognizably Trek—with all the optimism, cooperation, and empathy that it entails. For proof, look no further than “Take Me Out To The Holosuite,” a goofy, good-hearted baseball-themed lark stuck smack dab in the middle of the show’s grim Dominion War arc. By the 24th century, baseball has fallen out of fashion. But like a hipster with a passion for penny-farthings, Captain Benjamin Sisko (Avery Brooks) and his son, Jake (Cirroc Lofton), are connoisseurs of the obscure sport. So when Vulcan captain Solok (Gregory Wagrowski)—Sisko’s longtime rival—challenges Sisko and his crew to a baseball game, it’s not just a “contest of teamwork, courage, and sacrifice”; it’s also a matter of pride. The only problem is the rest of the Deep Space Nine senior staff can’t tell a fly ball from a first base. So it’s up to Sisko and Jake to whip the “Niners” into fighting shape in only two weeks. The rest of the episode follows familiar underdog sports movie beats with an added sci-fi flare (“We will destroy them,” intones Klingon Commander Worf before he even knows the details of the competition). Driven by a desire to put arrogant Solok in his place, Sisko pushes his ragtag team too hard during practice, even going so far as to kick off the worst member from the team, a bumbling Ferengi named Rom (Max Grodénchik). It’s not a great look for the generally tough but jovial captain. And Sisko’s obsession speaks to Deep Space Nine’s willingness to present flawed characters, something the earlier Star Trek series generally shied away from. But it’s in its final act that “Take Me Out” reveals its true Trek-ian spirit. After getting himself thrown out of the game for harassing the umpire, Sisko has a change of heart while watching a particularly wacky play unfold. “That’s what I love about this game,” he explains to a benched Rom. “You never know what’s going to happen next. 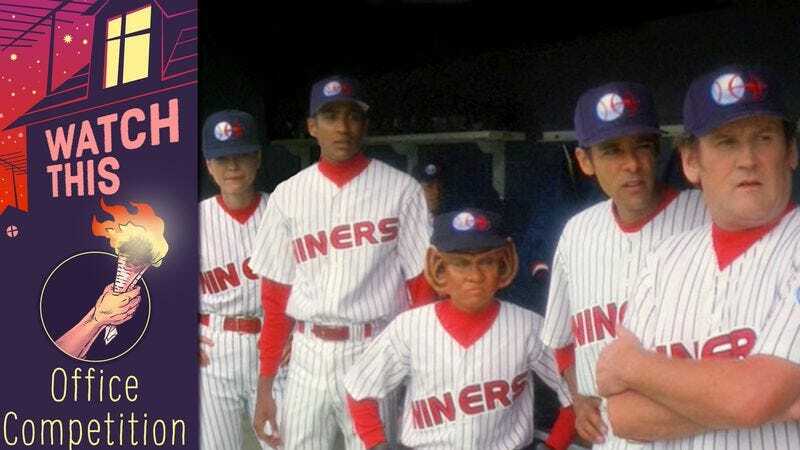 Every situation is different.” It’s only once Sisko remembers baseball is supposed to be fun and puts Rom back on the team that the Niners fumble their way to their one and only run—an emotional victory that baffles their physically superior Vulcan rivals, who beat them 10 to 1. “You are attempting to manufacture a triumph where none exists,” Solok snipes as Sisko buys a round of drinks for his crew. “To manufactured triumph!” the crew toasts. Although it has enough cheese to feed a small army, “Take Me Out To The Holosuite” stands as one of the more successful comedic entries in Star Trek history (which, admittedly, is not a very high bar). But more importantly, it captures Star Trek’s humanistic thesis statement: The future won’t be built on aggression and conquest, but on cooperation and friendship. Availability: “Take Me Out To The Holosuite” is available, along with the full run of Star Trek: Deep Space Nine, for streaming on Netflix, Hulu, Amazon Prime, and cbs.com, and on DVD.